Six Bachelor of Science students majoring in pharmacology have been offered positions in an industry-based learning (IBL) program with global healthcare company, GlaxoSmithKline (GSK). 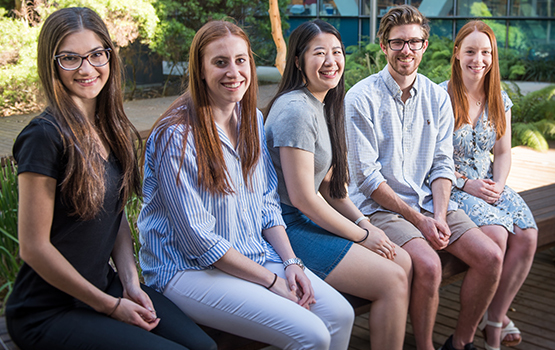 Building on Monash’s success in the competitive GSK IBL program in 2017, where two Pharmacology Honours students gained internships, Monash students secured six of the 69 places offered for 2018, working in areas including clinical trials, medical information, quality assurance and investigator-sponsored studies. GSK develop innovative products across pharmaceuticals, vaccines and consumer healthcare, with the aim of helping people “do more, feel better and live longer”. The IBL program is a unique opportunity for our students to gain invaluable, hands-on industry experience and build their professional networks, giving them a competitive edge for future career prospects. A strong interest in commercialisation made the decision to apply for the program easy for Bachelor of Science student Matthew Narayan. He hopes the experience he gains as part of the investigator-sponsored studies group will prepare him for future roles, with scope to work overseas. Fellow Bachelor of Science student Emily Fuller, who will be based in the clinical trials team, said she recognised what a unique opportunity she had secured in working for an internationally-renowned organisation. “It will be really nice to be surrounded by some familiar faces, too”, she said. Congratulations Emily, Matthew, Jasmin, Alanna-Maree, Gabriella, and Isaac - we look forward to following your success in the GSK IBL Program over the next year.